This shop was originally compensated as part of a social shopper amplification for Collective Bias and it’s advertiser. While checking out at the store the other day the boys asked to buy some gum (as always) which sparked an idea. So we picked up some Wrigley’s Extra Gum in polar ice, spearmint and peppermint. I always love making gingerbread houses but wanted to make something a bit different this year. So I gathered my supplies and assembled my houses. You can use storebought houses or cut out your own from homemade gingerbread OR just use graham crackers. Since I like my houses to last more than a few days I like to use a secret weapon. A glue gun. Yep I want my houses to stay standing! Next started my bright idea – gum stick siding! When the boys finally saw what I was doing they were impressed. Start from the bottom and work your way up. All the little touches were added on later and given plenty of time to dry (with the icing). I used the gum for siding, roofing, bricks, doors and shutters. You can get a clean line by cutting it wtih scissors. A bonus is your hands smell good from all the minty flavors! I mean, how cute is this?! For a final touch, I fashioned a couple little trees out of the gum wrappers. If you’re like us and ALWAYS have tons of gum stocking stuffers this would be a fun project to do after the holidays as well to use up leftover candy! 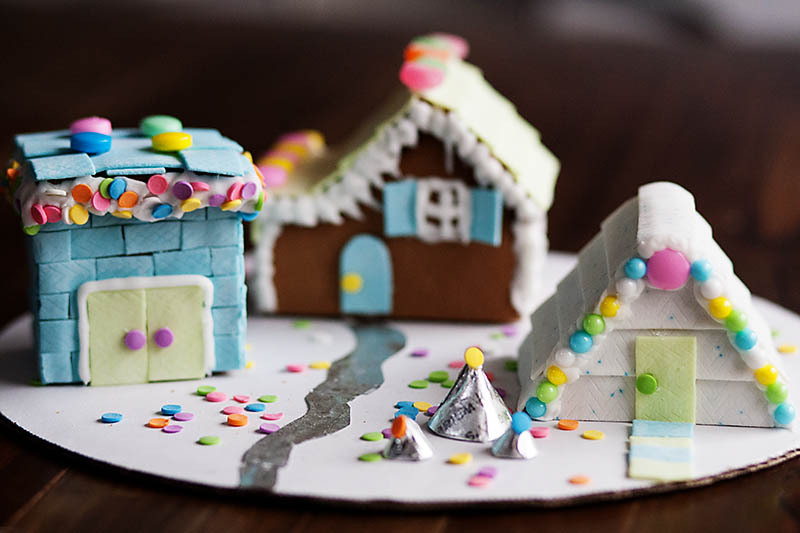 Do you make gingerbread houses as a part of your holiday traditions? I will have to try out your recipe next year – thanks for sharing. Oh my gosh I love this!!! So pinning this on Pinterest for next year! This is so cute! What a great idea. Plus, I love the photography! Beautiful.